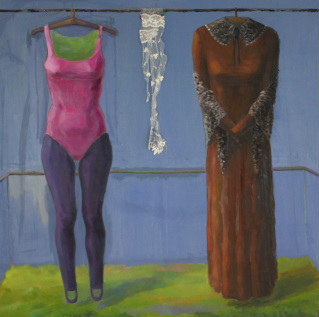 Cep Gallery, between 5th May and 5th June 2011 at The Marmara Pera, presents “Hidden Body” to the followers, the first individual exhibition of Berna GÜLBEY DERMAN who is young representative of contemporary Turkish art. The first individual exhibition of Berna’s, Hidden Body is oriented to remind of modes of being in between, sensation of individualism with data of minatory or personality by making them to become isolated in indistinct places. Artist represents hidden bodies who interrogate the design by its own will, who can not express themselves with data of open capitalism and the suspended objects by light games and using intensively transition tones of grey while adapting them to her canvases. she started Mimar Sinan University Fine Arts, Painting department in 2004. Artist graduated in 2010 and still lives in Istanbul.